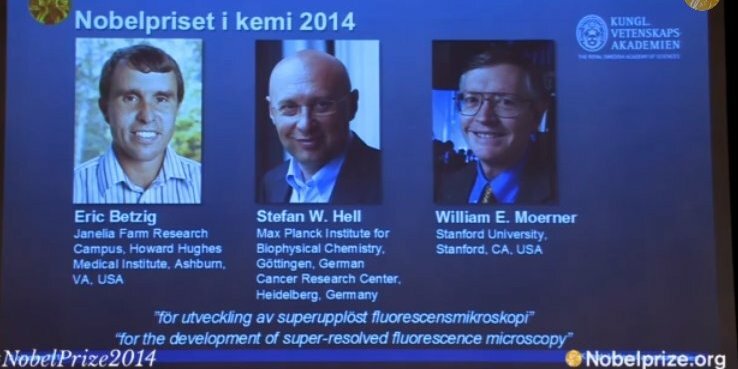 Nobel Prize in Chemistry is awarded jointly to Eric Betzig (USA) ,Stefan W. Hell (Germany) along with Willian E. Moerner (USA) for their innovative work in super resolved fluorescence microscopy. With the advent of knowledge of cells after Robert Hook and Anton Van Leeuwenhoek around 16th and 17th centuries, the curiosity towards knowing more about the cellular components, their structure and functions adhered to human minds. In recent years, microscopy has reached greater zones and enabled the researchers to look at the insights of the cellular machinery. This lead to treatments of several diseases. Still, the microscopy held numerous limitations. It was a known fact in microscopy that the maximum resolution for any microscope is 0.2 micrometres. The awardees Eric Betzig, Stefan W. Hell and William E. Moerner bypassed thi s limit and were able to obtain images with greater resolutions. Dr. Stephan Hell formulated a method Stimulated emission depletion (STED) microscopy with the use of two laser beams, one that enabled fluorescence molecules to glow and the other one cancelled all the florescence else than nano-metre-sized ones. This lead to minimum hindrance and maximum resolution of the image captured. Eric Betzing and Wiiliam Moerner working independently, worked out another method Single molecule microscopy. This method utilizes the possibility to turn the fluorescence molecules on and off. This only the desired molecule glow at a specific time leading to greater resolution.